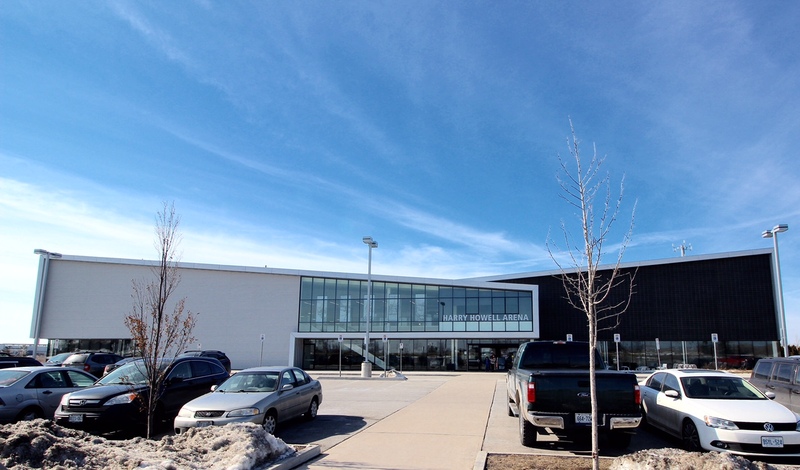 From an aged barn-like structure to a LEED certified facility, North Wentworth Arena has seen quite the transformation. 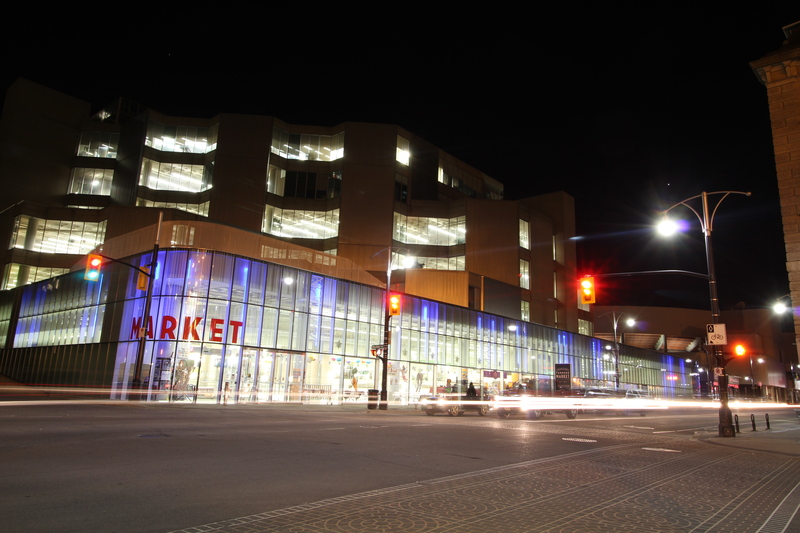 The 18-million dollar twin-pad arena designed by dp.Ai Architects, in partnership with RDH Architects, was completed in 2012. 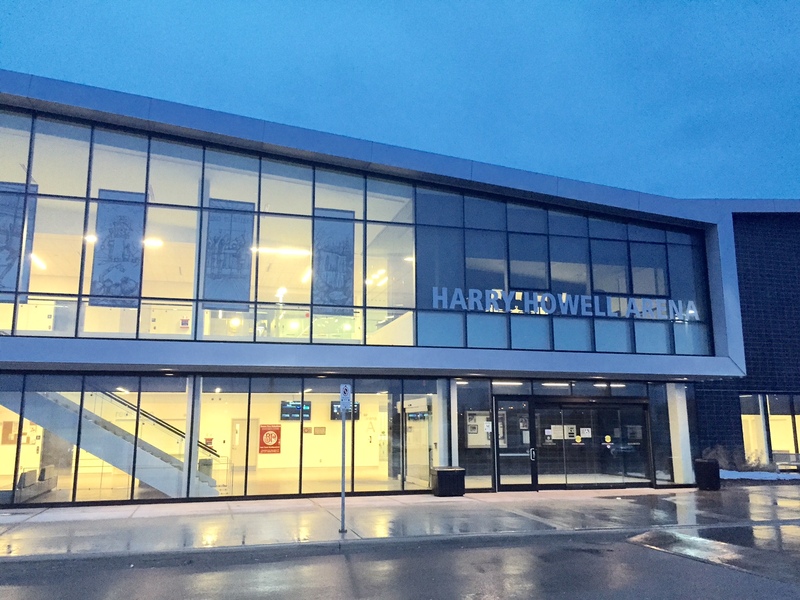 In October 2014, it received a new name: The Harry Howell Arena. 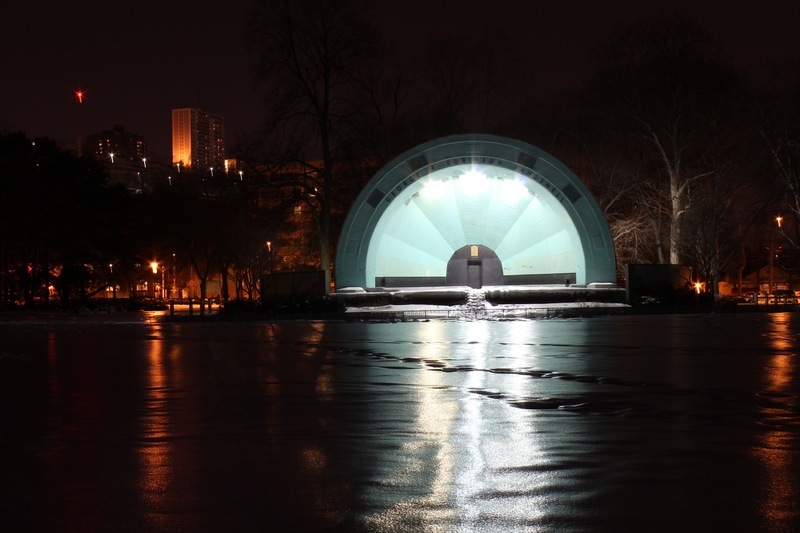 Named after legendary hockey player and award-winning broadcaster from Hamilton, Harry Howell. Tucked back amongst the countryside to the northwest of Clappison’s Corners, it sits imposingly as a stylish modern sports facility. The inverted pitched roof, corrugated cladding, black concrete blocks, and glass band entrance stir an instinctive competitive spirit as you approach. The interior is the opposite of imposing. It’s warm, functional, and sleek, with many contemporary touches. 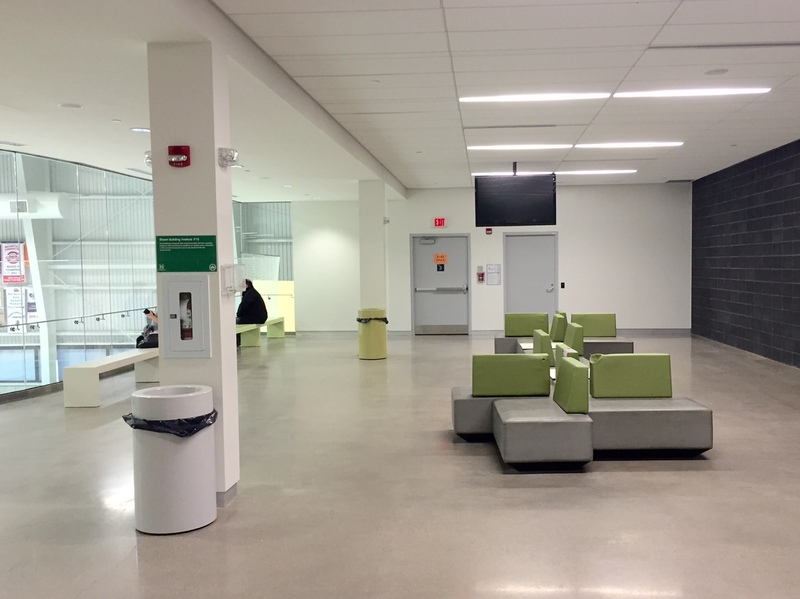 The first floor is outfitted with modular sofas, plastic covered backless benches for viewing, even coloured tubular garbage cans. 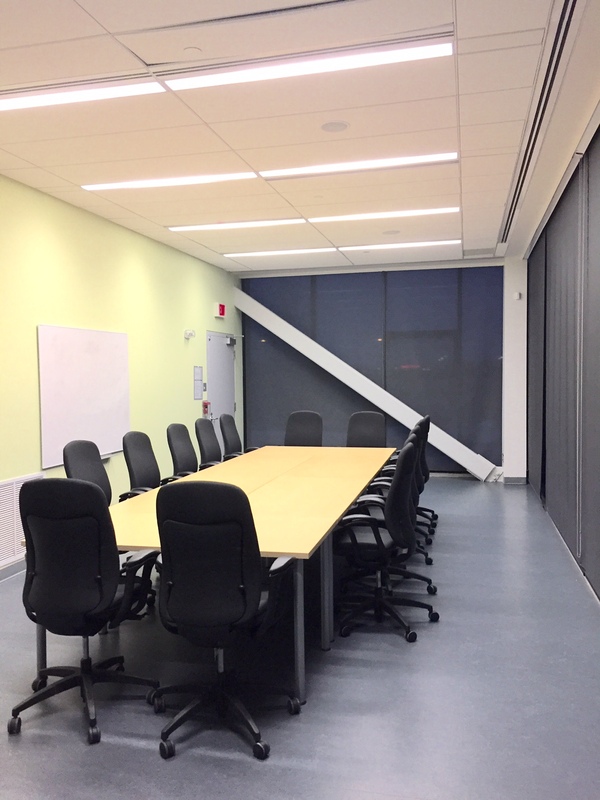 There’s also a small boardroom at the southeast corner, surrounded by windows and exposed structural columns. 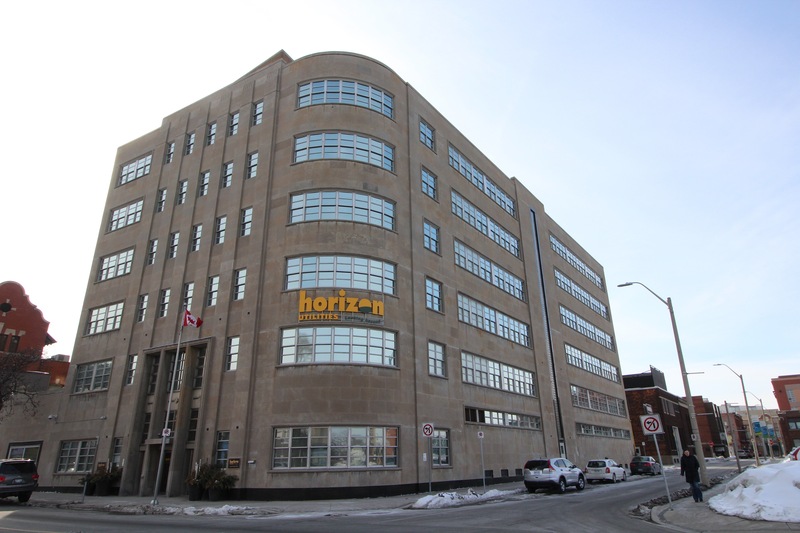 The second floor is accessible via elevator or a frameless glass-railing staircase. 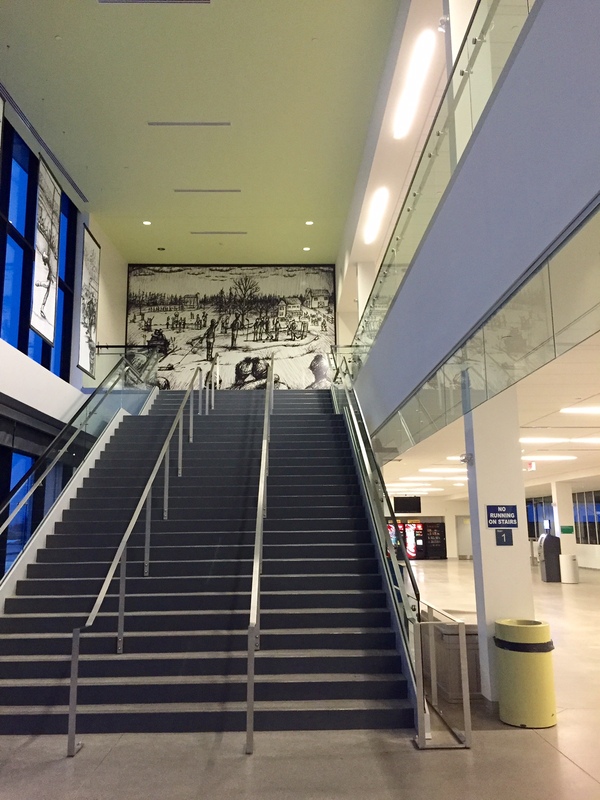 Banners with murals from local artist Andrés Correa line the second floor windows and wall as you ascend the stairs. More modular sofas and benches inhabit the space, as well as a small kitchenette for events, and a larger boardroom to the southeast. 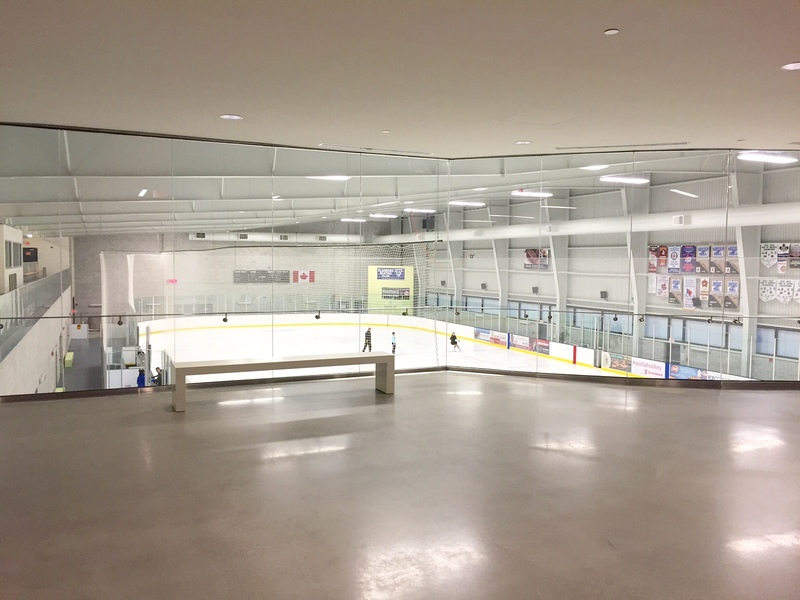 The views of the rink are through floor-to-ceiling frameless glass, offering the spectator a warm unobstructed view from above. 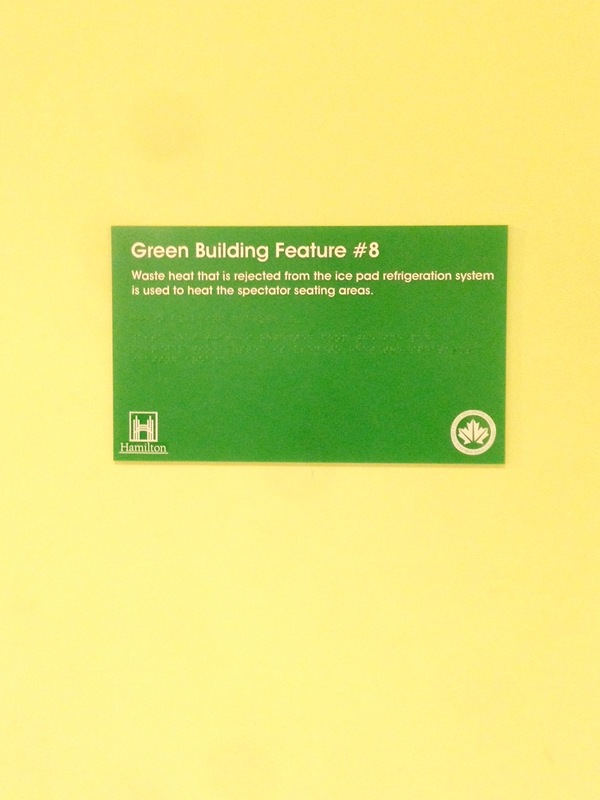 Throughout the building, the columns and walls have informative plaques highlighting the environmental and sustainable features, which awarded this building LEED Silver status. Inside the rink space, the pre-engineered steel framing is exposed with a non-traditional rigid frame. 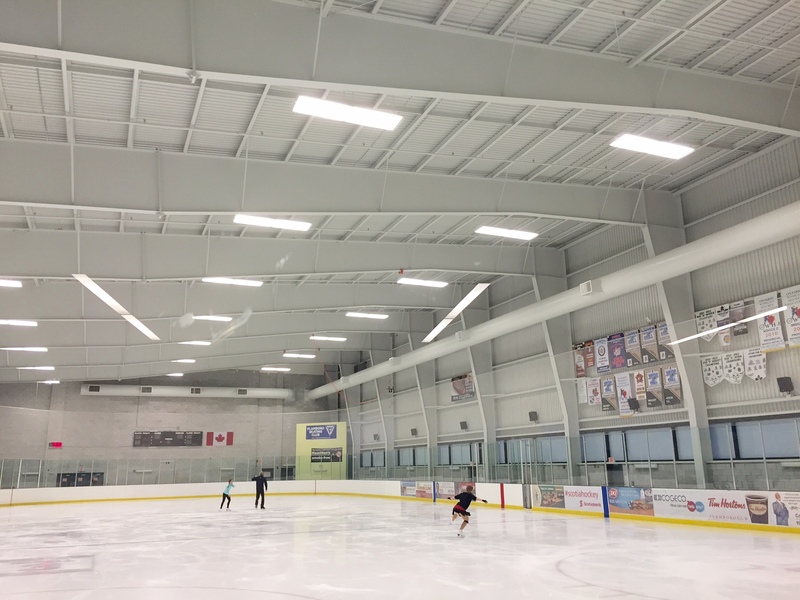 The H-beams line the ceiling and wall of the rinks, angling and dropping against the load bearing metal sheets like the legs of an arachnid. Spectators have clear views from orange polyurethane benches on the second floor, above the dasher boards wrapped in protective netting. 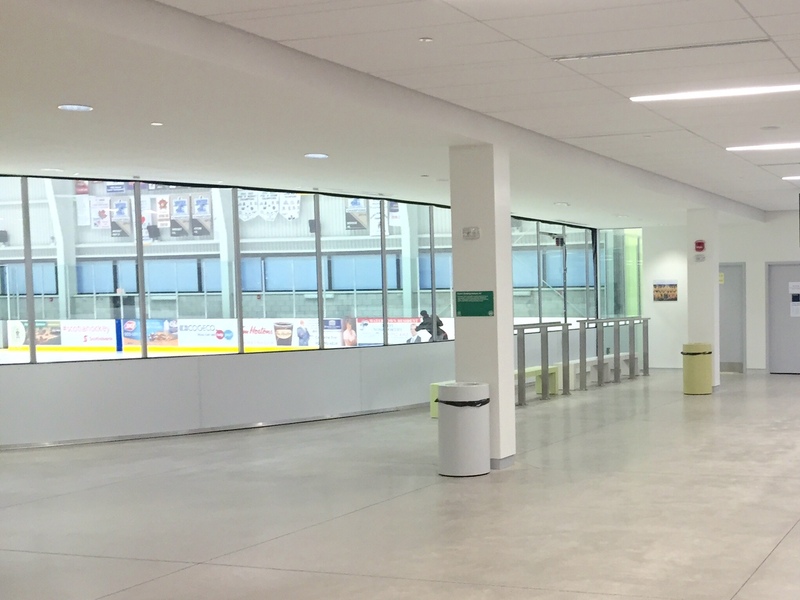 The main floor of the rinks is for coaches, players, and staff only, but the outside viewing area is right against the boards. 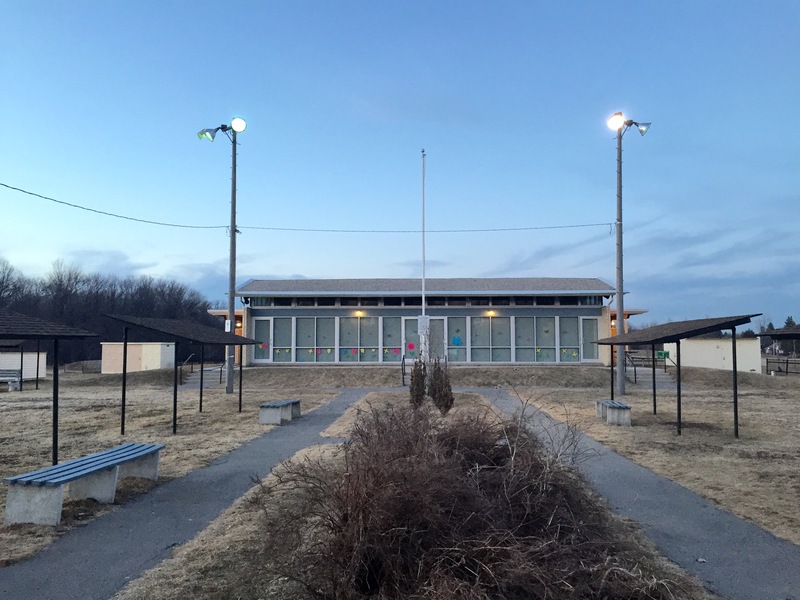 Both rinks are well lit with an efficient use of natural lighting via bands of frosted glass windows that line the exterior walls. The twin-pad arena was part of a master plan that included the relocation of two soccer fields, accommodation of a proposed highway interchange, and preservation of the existing arena. 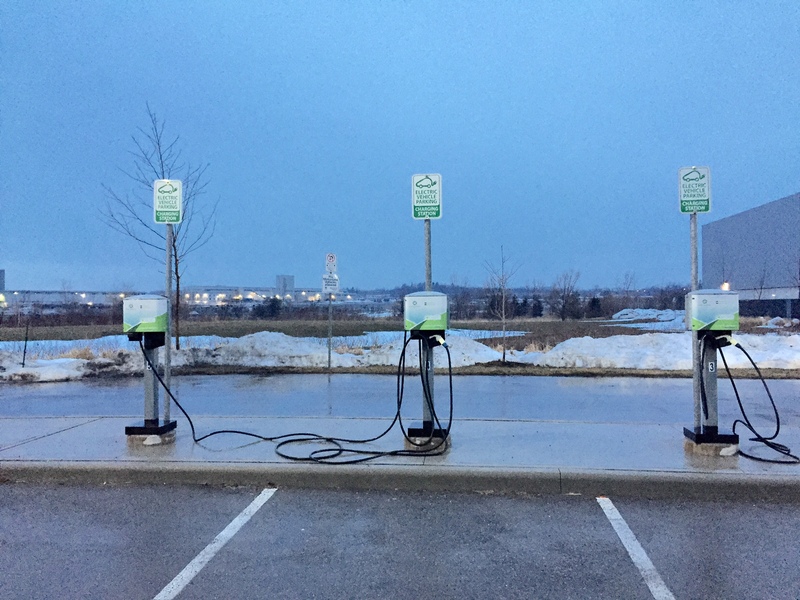 It also includes an expanded parking lot with charging stations for electric cars.